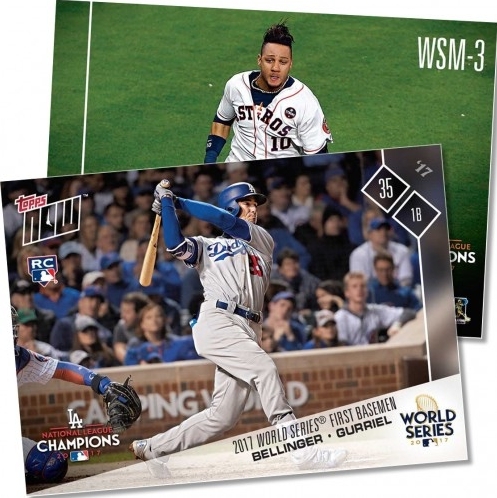 Getting down to business, 2017 Topps Now World Series Baseball celebrates the two teams squaring off in the Fall Classic. 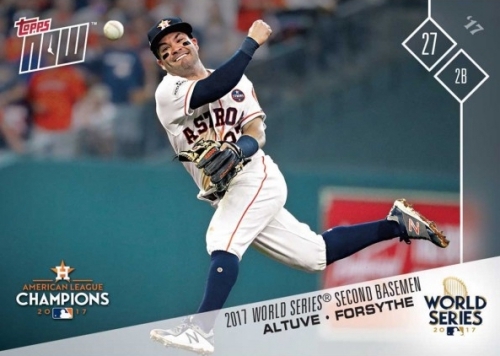 Featuring the Houston Astros and Los Angeles Dodgers, the 2017 Topps Now World Series cards are an extension to both the main 2017 Topps Now Baseball and Now Postseason Team Sets. There is also a specific Now set issued later for the World Series-winning Houston Astros. However, this online exclusive is distinguished by a numbering prefix that begins with "WS" to reflect the annual event. Shop for 2017 Topps Now World Series Baseball Cards on Topps. While individual cards are priced at $9.99, a discount is applied for those who buy in bulk with several tiers that lower the price-per-card amount. There is also a 10-card bundle that includes all the Matchups options for $59.99. Each of the 2017 Topps Now World Series cards are available to purchase for just 24 hours via the Topps Online Store. Come back often as we will add any new information to the checklist, including print runs, bonus cards, and more. Shop for available Now World Series Baseball cards on Topps. Review additional details about 2017 Topps Now Baseball with our other comprehensive card guides.